I added most pictures from the course onto this video. A couple of projects I didn’t add include- “hipster name generator”, “home video gif”, and “what they might’ve done on social media” because I felt they wouldn’t have made sense in the context of a video. I also didn’t add “what’s the meme” and “remix guiness book” because I don’t really like my creations for those two. I took the title to be a reference to the Bob Dylan song, “Subterranean Homesick Blues” and this image is from that music video. 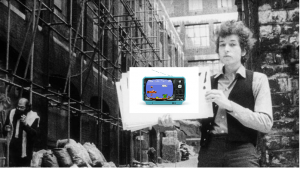 I then added a picture of an old TV playing Super Mario- just because I thought it was kinda funny. I think the man walking in the background is Allen Ginsberg but I am not sure. Wash your hair only on days you work out. This is one of the biggest things I could do for myself. Not being able to shower until I exercised got gross. I began to look forward to showering much more and couldn’t wait for the next one… but that meant I needed to run first. Put on your workout clothes. Forcing myself to go to the gym and just put on running clothes was enough for me. I felt pretty silly if I went in and changed and then changed right back out of the clothes. I’m already at the gym in my clothes… why not do the full workout and crank my music up & just get it done. Remember why you started. Always remind yourself why you are running and what is in it for you. You trained hard to get to where you want to be. You can continue work towards your goals and succeed if you just don’t give up. Going for a run when all you want to do is sit in front of the TV separates mediocre runners from the best. Try group fitness. I found that when I joined a group class and found friends that actually wanted to be at the classes, I found myself actually excited to exercise. I couldn’t wait till the next class and even joined more so that I wouldn’t have to wait a full week to go again. Surround yourself with motivation. The picture on Buzzfeed had all these notepad stickies with some sort of motivational quote on it. So this is exactly how I went about it. I wrote out about 15 different stickies with sayings I liked and plastered them anywhere I normally go… especially places I go before a run or am contemplating a run (ie. my closet). That way, when I saw the stickies, I’d get a little boost of motivation to lace up my sneakers and get it done! Give yourself micro-challenges. When I was trying to pick up my pace in my training runs, I used this to motivate myself to run just 3 minutes at this pace and then I could slow down, then another 3, and another 3, etc. I found myself running more and more of these and increased the time I ran at that pace until my training runs became at that pace consistently. And give yourself longer-term challenges too. 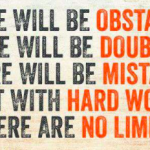 There is always a goal to work towards. This year I’d like to finally break my PR in the 5k during my last collegiate Cross Country season. I’d also like to go to the Regional meet and potentially place. Most often times, thinking about this gives me motivation to get the run done even when I don’t want to as I know it will all be worth it later. Workout with people who will cheer you on. Running with someone that wants to see you succeed is huge. Using the buddy system is also a good idea… count on each other to actually get a run in. On the days you don’t feel like running, the partner can push you to get your sneakers on, and vice versa. Keep each other accountable and find someone that you can have a good time with. Do it for the pictures. If nothing else works, run for a good Instagram picture. Run during the sunset or the sunrise to the beach or to the woods, wherever you can get an Insta-worthy snapshot. Though you are running for a non-traditional reason (that exercise is good for your body or you are working to reach a goal) it’s still getting you out to exercise. So hey, why not? Think about how you’re sticking it to your doubters. People will tell you you can’t do this or that; that you can’t run a certain time or beat a specific person. There is bound to be someone like this in everyone’s lives. Sometimes you may even have more than one in your life at a time. However, the only person you need to please is yourself, and if they don’t approve, who cares. They don’t control who wins the race at the end of the day. The next person that tells you you can’t do something, have the guts to say, “Watch Me”. Trick yourself into going longer miles. At times all you can do is bargain with yourself to at least do a few miles. Tell yourself, “I’m just going to run 3 miles out”. This doesn’t seem so bad when you think about it, however once your actually 3 miles out you realize you have to go back. There’s no other option than running back… so you might as well get a move on. By the end of the run you have 6 miles under your belt as opposed to the 3 you originally “agreed” to. Challenge of the Day: Try at least one of these each week and see how they work for you. If you struggle to get a run in most days because you are constantly battling with yourself, it may be time to switch up your routine. Embrace trying new things and you may end up surprising yourself with the results at the end of your experimentation. Keep on living your best life. Today’s challenge was to simply find old things and make something new out of it. The pictures on the daily create website were quite abstract however so coming up with something as old as they were, was quite interesting. However, I have some very old coins and an old beanie baby token as well as a necklace that my great grandmother had. I figured I could use something out of these three categories. Unfortunately, some of my favorite assignments we did were either GIFs or videos and could not be uploaded, but I have had a lot of fun with still pictures too. Getting this video onto here was an exercise in patience. While using Movavi for video editing was not so bad, the file was too big to upload. Using an idea from another user, I decided to upload it onto YouTube and embed it here. This was a very fun last assignment for me. I used iMovie to make my compilation. I’m not super familiar with the application so it took me a little while to figure out how to use it. To start out, I screenshoted the tweets and saved the memes I wanted to use for this. Then I screen recorded my Timeline project and my Fakebook since I wasn’t too sure how I would insert them any other way. To do this on an Apple, you can open QuickTimePlayer and create a new screen recording from the ‘file’ menu. This method worked nicely since they were already in the .mov format you need to have moving pictures in iMovie. I noticed that my .gif files weren’t moving like they were supposed to so I had to look up how to have GIF files show up correctly in iMovie. So I ended up screen recording part of the screen in order to just have the GIFs in .mov format. That worked nicely and I just laid out each part as I liked. The photos are zoomed and moving by default, but I switched the cropping so they were still and showed the full photo. Lastly, I wanted to add music to my video since it would be quite boring and painful to watch if it was just silence. So I found some royalty free music to use in the background that wasn’t just the iMovie music that everyone uses. Today’s Daily Create challenged us to take a hard concept that we either study or teach and reconstruct it so that a 5 or 6 year old would be able to understand in. In the worlds of Albert Einstein, “If you can’t explain it simply, you don’t understand it well enough”… So off I wrote. I figured it was only fitting to take a topic from Sports Psychology as I am looking to go into this field for both my graduate program and career path. I chose to talk about Visualization which is the act of imaging the very thing thats causing you anxiety goes well. For an example, if you are nervous about a test, imagine yourself acing the test just before you actually begin the test. In the same way, if you are nervous before a race, imagine yourself winning the race or getting your PR, just before the gun goes off. Typically when one envisions themselves doing well, the anxiety goes down without the person even noticing. Anxiety affects the persons performance if they let the anxiety overwhelm them or steer them into a direction of giving up or accepting defeat before the activity has even started. Explaining this to a 5 year olds level was fairly hard though as there are many different “layers” to visualization. However, I did my best and this is what I came up with. The last assignment was to make a video with our past DS106 assignments, or at least our favorite ones. 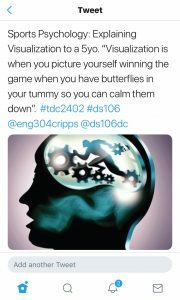 I personally had a great time doing the DS106 challenges so I enjoyed going back and looking at the older stuff I did and getting a second chuckle out of them. This time I used a website called SmileBox that allowed me to upload as many photos as I want, pick out a template and arrange the pictures in the way I want. This website worked for the purpose of simply just getting photos onto a video that had background music. However, most of the cool design templates, manual changes to the video such as music, and the ability to link the video a blog all were apart of the premium package that charged you $3.99 per month & $50 annually. Therefore, I went with the free option and did what I could. 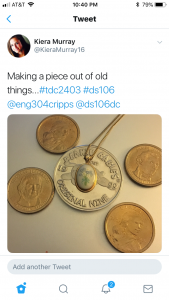 Because I don’t have the option to link the video directly onto the page, the link for the DS106 Compilation Video is HERE. I really hope the original picture is older than what I think it might be. To do this, I followed a tutorial in the assignment bank and used Powerpoint to crop the picture of myself then moved it onto the original. I had initially planned to use GIMP and even downloaded it, but by the time I finished moving the pictures together I realized it was not even necessary to edit anything else, it all came together on only Powerpoint. While cropping out the background on my picture was a pain, it was actually quite a bit of fun once I got into it. I can hopefully try it again in the future and put my newly downloaded GIMP to better use. 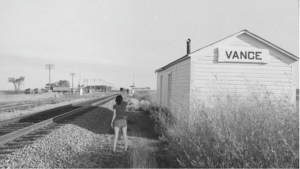 This assignment was to insert yourself into a historical photo a la Forrest Gump. 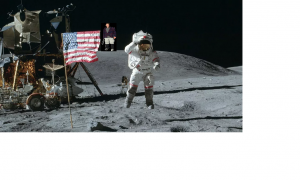 I added myself to a famous picture from the moon landing so it looks like I’m staring at the astronaut. The picture of me is from a hiking trip I took to the Adirondacks last winter.